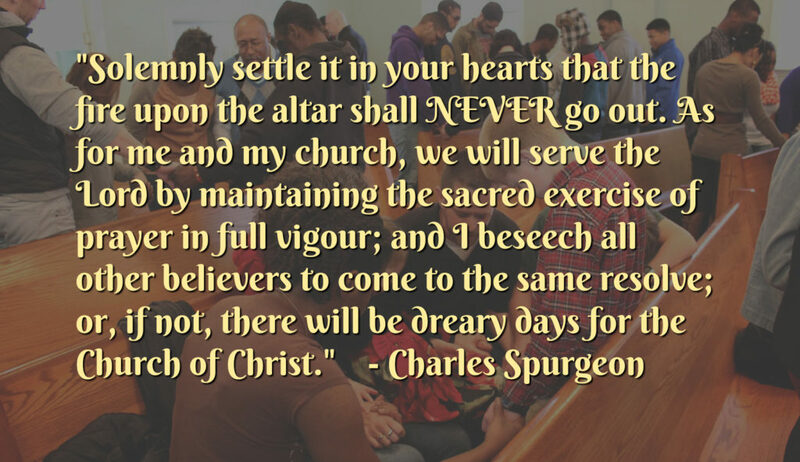 Charles Spurgeon on Prayer – The fire shall NEVER go out! “If any believer should chance to live where the prayer-meeting is neglected, let him now resolve to revive it. Let us make a solemn pledge and covenant that the churches will pray, or that it shall not be our fault if they do not. To strengthen a prayer-meeting, is as good a work as to preach a sermon. I would have you vow that the prayer-meeting shall never be given up while you live. Charles Spurgeon, Only a Prayer Meeting: Forty Addresses at Metropolitan Tabernacle and Other Prayer-Meetings Language Slightly Modernized.